Looking for baby nursery paint ideas? You’ve come to the right place. 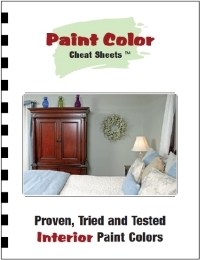 The first thing to consider when painting a nursery is how healthy the paint job will be. Pregnant women, infants, and young children are particularly susceptible to VOCs, or volatile organic compounds. The paint you choose for your baby’s nursery should be low VOC or, even better, no VOC or all-natural. Remember: the cutest paint job in the world is worthless if it puts your baby in danger! 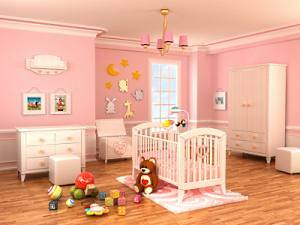 Baby nursery colors have traditionally included pink, blue, and gender neutral yellows and greens. These are good starting points, and lend themselves well to a variety of themes. One hot trend right now is to pair mint green, soft blue, or cotton candy pink with deep chocolate brown. Blue isn’t just for boys, and, surprisingly, pink isn’t just for girls. Try painting your daughter’s room sky blue, and adding some girly details by painting a white picket fence, pink and yellow flowers, and tufts of green grass on the lower half of the wall. Or, send your little boy off to slumber in a tropical paradise: create a sunset effect with shades of orange, yellow, and pink, and add in some palm-tree silhouettes for a relaxing, beachy theme. Clouds and stars are favorites of both boys and girls. 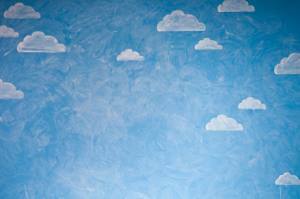 Puffy white cumulus clouds are one of the easiest effects to create, and you can limit them to the ceiling, or extend them down onto the wall! Glow in the dark paint is a fun way to create realistic nightscapes. Either use stencils for perfect, five pointed stars, or just use dots of paint for a more true-to life experience. Random application is just fine; for a more educational approach, rent a projector to accurately place constellations and galaxies! Baby nursery paint jobs are a good place to try unusual patterns. Polka dots, stripes, and zigzags are all fun. High contrast makes rooms look smaller and less formal, while using similar tones (or even the same color in different finishes) creates a more sophisticated feel. Choose colors that are already present in the bedding or other accessories for a cohesive feel. Try splitting the room horizontally with a chair rail or wallpaper border. Paint the top half of the room a light shade, accented with darker polka dots; then paint below the division with the darker hue. Or, try stripes on the bottom half of the wall, and a light shade up top. Many baby room paint colors can stand on their own, without fancy treatments: paint the top half of the nursery a light color, and the bottom half a more saturated shade. Accentuate the split by painting the chair rail a glossy white. Painting baby rooms with faux finishes is fun and easy. Try sponging, rag rolling, or a color wash – these techniques are all fast and almost fool-proof. The illusion of texture is a great way to disguise uneven walls. Try a sky blue base with a periwinkle glaze, or maybe a soft peach under layer and a coral finish. Murals are fun if you’re artistic; a projector can help you accurately recreate a cartoon character, animal, or favorite photograph with ease. Too pressed for time to paint a full-blown mural? Try using a stencil to create a flowing border around the room. Inspirational or restful phrases are also good; perhaps “Now I Lay Me Down to Sleep” above your baby’s crib? For a personal look that will grow with your child, try a funky monogram. Nothing says “this is my space” like your child’s initials above the headboard!